Aaaaauuuuuppppphhhhhhhhffffffttttttt!!! Yaw-AWN stretch scratch repeat- What day is this? Feels like I slept all summer. Monday you say? Must be time for coffee. When was the last time I did MMC anyway? Sheesh. Oh well. Come on. Sit down. Let me pour you a cup. Is that better? Good. Well, what can I say? 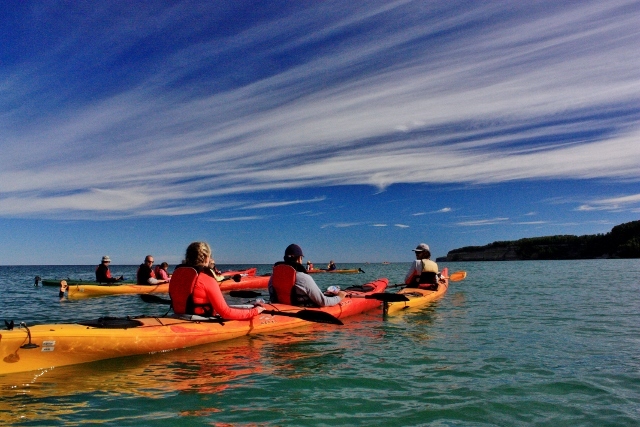 It was a glorious and fiendishly busy summer. I worked overtime, worked on the side, fished every chance I got and in general enjoyed myself. I also took up running. Why you ask? I don't know why, other than that I've been looking for a good way to exercise and realized that for the price of a pair of shoes I could go right out my door and have a really vigorous workout in 30 minutes or less. I've run in several 5k and a 10k runs and I'm going to run my first half marathon this fall as my long runs are already over 13 miles. But you don't care about that.Why? 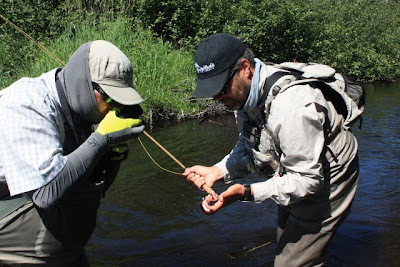 Because this is a fly fishing blog and your number one question, the one thing on your mind is "How about the fishing?" I've always said the fishing in Michigan could hold its own with any other place in the world, but this summer has emphasized that point. It's not just the variety of opportunities, species and water types, it's the sheer numbers of big fish. 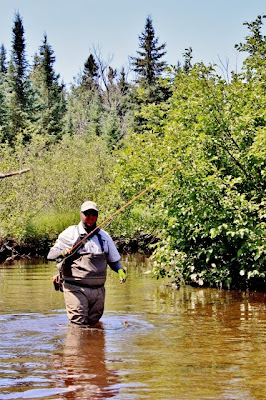 I fished the Hex hatch a lot this year, especially on the Au Sable. There were multiple big fish feeding on every stretch of river. I landed 6-7 fish in the 18-19" range, but not any over 20"- the ones I'm after. 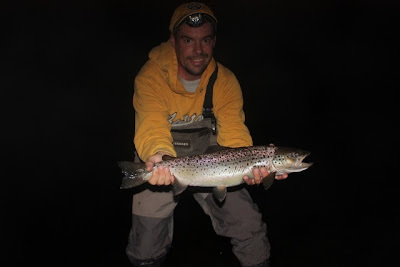 That came last Monday night when I landed a 24" brown while mousing. Yes, September is a great time for mousing. Likewise with the flats fishing. Big fish everywhere, though the bite was exceptionally tough this year. Bad timing on my part. I still managed some decent bass and one pig of a carp that was 22-24 pounds. But that's pretty much over with now. 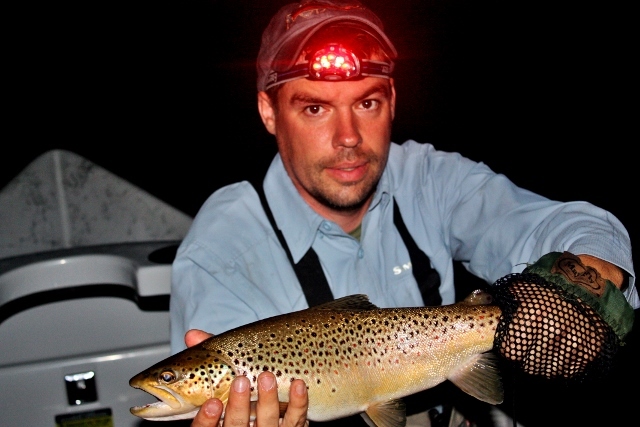 September is one of the best months for fishing here period, the fall equivalent of May. 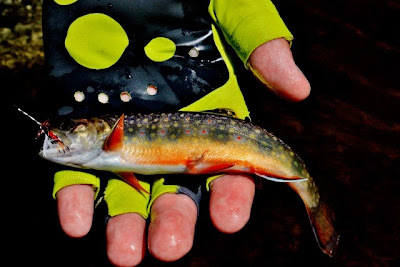 The browns and brook trout are feeding heavily to bulk up before spawning in November, and the streamer bite has begun, while mousing at night and terrestrial bugs are still hot. The salmon runs are in full swing and reports are that the runs are heavy and the fish are huge. I caught my first king last night, an 18 pound brute that smashed my fly then took off up river and disappeared around the bend. He ran more than 200 feet upstream and when I caught up with him there he turned and ran at least 700 feet downstream through two holes and two sets of rapids. I fell twice and bruised both my knees on the rocks. It was perhaps my toughest salmon fight ever. You don't fish for salmon because they're beautiful or require finesse; you fish for salmon because it's a brawl, a knock-down, drag-out fight, and a real test of your gear and fish handling skills. One bad knot, one misplaced step or one mistake with your line and it's over. 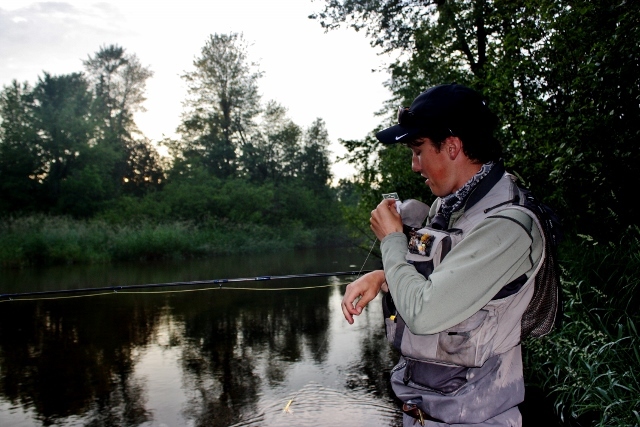 Salmon fishing is an athletic activity rather than a relaxing pastime. Personally I don't care for salmon all that much. 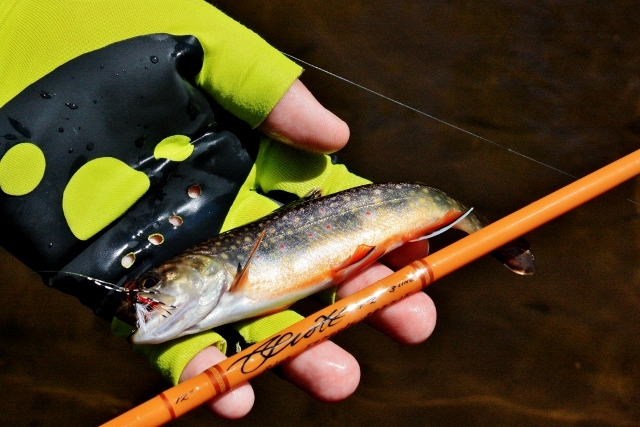 I'd rather catch browns or brook trout. My personal goals for the fall are to target some bass and pike on poppers, then get in on the streamer action. I would also like to swing some streamers for kings and cohos later in the month. I'm buried in work right now so we'll see what I can squeeze in. 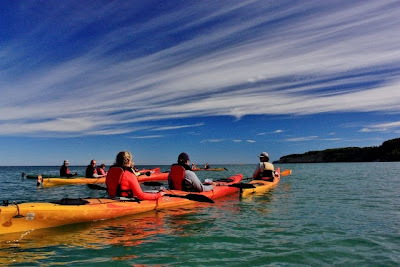 I have a rod review in the works and just got back from a fantastic kayaking trip at Pictured Rocks National Lakeshore near Munising which I'll have to share. I have a few other tricks up my sleeve so stay tuned. For now the coffee is gone and it's time to get to work. 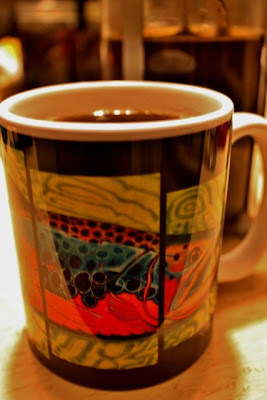 I'm sitting here comfortably sipping my coffee this morning while reading some headlines and surfing my social media. The Colorado flooding seems to dominate both. This seems to be unfolding a bit like hurricane Katrina- first some reports here and there of flooding, then dramatic pictures and video, then the realization that the region is still in the grips of a full-scale catastrophe and not just a passing flood. And I have to stop myself from wondering how this will affect the fishing. It's just not important right now. I think of my (online) friends Erin Block and Jay Zimmerman. By all reports their home up in Coal Creek is cut off from the outside world. They still apparently have power and internet, but last I heard the roads are impassible. I guess I'll do a little worrying for them and wonder aloud what will happen if the roads are gone and they have to leave in order to not be isolated there. This worry may be a little premature, but it's already reality for many communities there in the mountains. Some have been simply washed away along with the roads in and out. Their recovery will be measured in years, not days or weeks. I've been discussing several controversies lately in the fly world with my friends- issues over secret spots, methods and conservation issues. 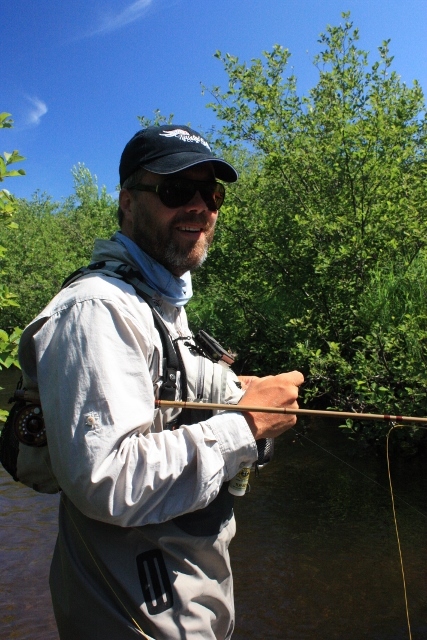 Fly fishing is a fantasy land of little fiefdoms, fan clubs, cliques, sects, gear nerds, high priests and devotees. It's the perfect escape from issues like genocide, war, terrorism, famine, starvation, natural disaster, political repression and upheaval. Nothing soothes all that away like the sound of running water and the smell of watercress, while deciding which fly to tie on. 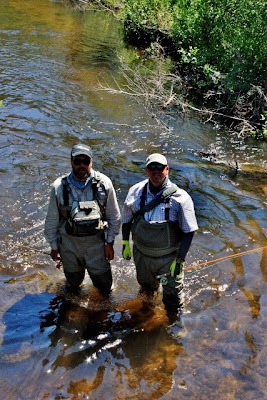 But when one of the world premiere fly fishing destinations, and one of the most beautiful places on the planet, is hit by such devastation, my thoughts are not on the fish and fishing. There will be time for that later- much later. For now my concern is for my friends whose lives are being rearranged. It's for the lives lost, the others who are still awaiting rescue, their homes and livelihoods destroyed, and I think of the years it will take to rebuild and recover, with the knowledge that some things will never be the same. It also reminds me that there is a disaster every day somewhere in the world. 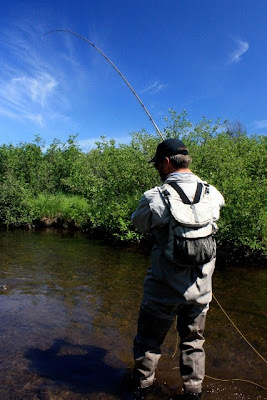 Wars that don't seem to end, famines, other natural disasters, human stupidity that causes endless and needless suffering, and when I think of this I'm no longer inclined to debate whether Tenkara is really fly fishing or whether catching steelhead on the swing is the only "pure" way to fish for them. To my friends in Colorado- stay safe and I wish you the best. In the face of disaster I don't know what else to say. There's always that one fish that haunts you. It was the end of June well into the Hex season, one of those warm, humid, and calm June evenings that scream "Hex!". I called up my friend Zach Ginop to see if he was ready to go. We met on the river an hour later. We waded up to our chosen spot. As the sun dipped below the horizon the fish began to feed, and we even hooked up briefly on a couple decent fish, but after awhile we just stood there, watching the glowing dusk and the fireflies, waiting for darkness. As soon as it was dark we could see Hexes stirring, flying up the river forty feet above. We stood there, listening to the river come alive. 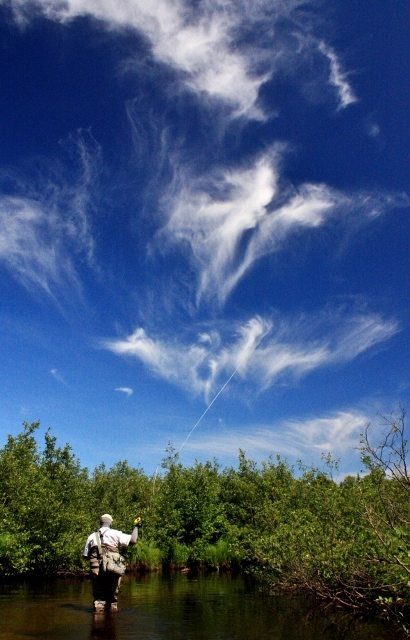 Two rather large fish started feeding well above us; we nodded to each other and began moving upstream. We had barely started when a small fish fed 25 feet above us. "Hold on Zach, let me feed him some Hex" I said. He stepped out of the way and I made my cast. There was a loud "Gulp" and I set the hook. 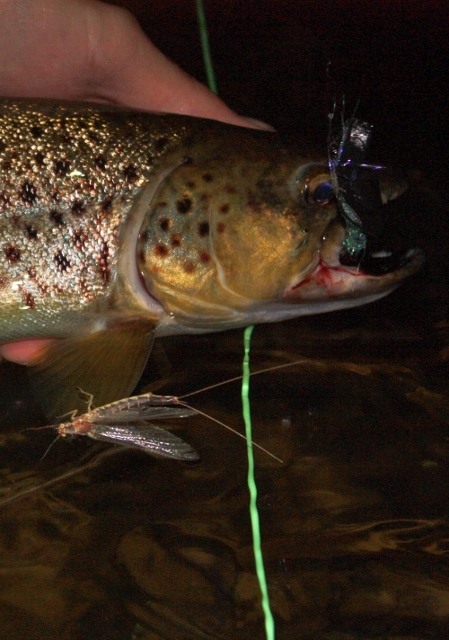 There was no hesitation or head shaking- the fish took off immediately taking half my fly line with it. I looked at Zach and said "This is a big one", while reeling down as hard as I could, holding my rod sideways and perpendicular to the fish, trying to turn its head. It responded immediately, and despite my efforts to palm my reel it took off even faster, knocking my knuckles in the process and peeling off the rest of my fly line plus a generous measure of backing with it. I looked at Zach and said "I think we're going to have go after this one", laughing in the dark. We have big fish where I live. Most guys fish the Hex hatch with a 5 or 6 weight rod; I use an 8 weight coupled with a Ross CLA reel and 12 pound tippet. When I'm fishing kings or steelhead I'm ready to start chasing the fish the moment I hook up. Most browns however will only make short runs and are content to duke it out in the hole you found them in. Their number one trick is to crochet themselves into a log jam and bust you off, not make a run for it. My mistake, my thought process was "It's a brown, what could it possibly do?" I found out. As soon as Zach and I started upstream, laboring against the waist deep current, the fish took off again and broke me off. 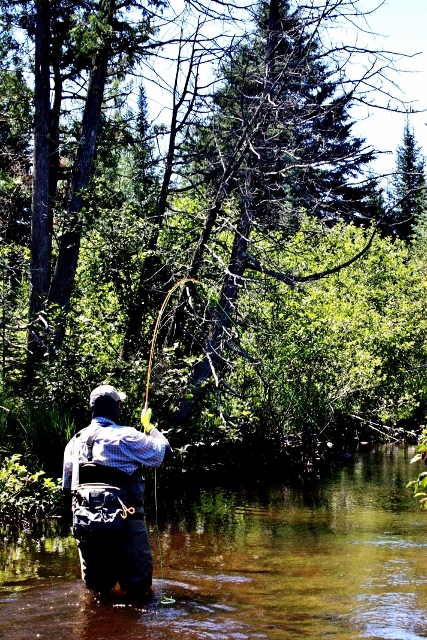 I stood there breathless and reeled in 150 feet of line and backing. That fish made our summer. this photo tells a tale. Smaller fish caught on a mouse pattern. Notice the Hex on the water. My friend and local guide Zach Ginop is one of the fishiest guys I know. You can book trips with him in Northern Michigan by contacting Boyne Outfitters. Not as in "aw shucks", but as in the shed exoskeleton of hatching mayflies. The mayfly in question being Hexagenia limbata. Several emerged in the mid-morning sun as if to add punctuation to this point, and later, a lone female was laying her eggs on the oily surface. This wasn't a great sign. Brook trout are pretty aggressive and love to feed mid-day, but fishing on the cusp of a Hex emergence. . . well, it certainly puts Hex on your fishing. I normally wouldn't have minded. This is my favorite river in Michigan and perhaps the best brook trout river in the state. But I was under a bit of pressure, as I had with me Cameron Mortenson of The Fiberglass Manifesto and Christian Horgren of Fine Tackle- he's a glass rod builder of course, and from Sweden no less. I won't bore you with how hard we worked or how slow the fishing was. I caught the big fish of the day, all of 8 inches. We caught numerous small fish, and we rolled fish everywhere I said we should with a couple minor exceptions. Cameron is like an old friend to me now, and one of the great mentors to this blog, and Christian reminded me of all my European friends- friendly, competent, more worldly than most Americans, but not in a bad way. In the end it was a great day. The fish were small but gorgeous; we laughed, shared a couple beers, took pictures and did what bloggers do. Cameron took product photos (he was testing the Redington Butter Stick for a review) and I did my best to put them on fish. I do have my pride. This piece of river regularly gives up 12" to 16" brook trout for me but none were in evidence this day. In the end all we had were gorgeous fish, great friendship, and great scenery. And thus is the life of bloggers. Keep up with all that is cool in fly fishing at The Fiberglass Manifesto and be sure and check out Christian's beautiful glass rods at his Fine Tackle blog.